This concert has been RELOCATED to Wesley United Methodist Church (98 N Maple St, Hadley, MA 01035). The Porter-Phelps-Huntington Museum concludes its 37th season of Wednesday Folk Traditions with Tim Eriksen, “widely regarded as the best ballad singer of his generation” (BBC Radio). Ethnomusicologist, experimentalist, and leader of the “shape-note” tradition, Tim Eriksen performs modern interpretations of traditional folk songs from the Pioneer Valley and beyond. Eriksen combines chilling vocals with instrumental accompaniment on electric guitar, banjo, fiddle, and bajo sexto - a twelve string Mexican acoustic bass. This performance and all Wednesday Folk Traditions concerts are held Wednesday evenings at 6:30 pm in the Sunken Garden. Admission is $12, $2 for children 16 and under. Picnickers are welcome on the museums grounds starting at 5:00 pm. The museum and its grounds are a smoke-free site. 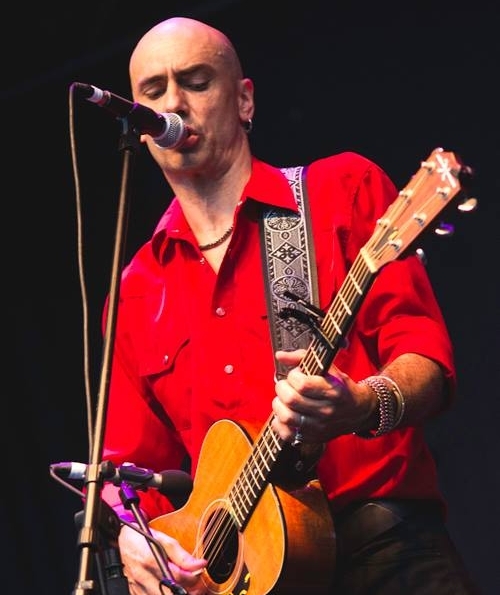 Tim Eriksen, hailed by T Bone Burrett as "one of the best singers in music," draws from his background as an ethnomusicologist to create a unique sound influenced by such diverse traditions as New England shape-note and Appalachian folk music to South Indian classical music and Bosnian pop. “A storyteller at heart, with a distinctive, unvarnished voice” (The Washington Post), Eriksen performs his haunting originals alongside ballads, love songs, and Sacred Harp music. He has established himself at the forefront of Americana music today, performing on Prairie Home Companion, at the Academy Awards, and contributing soundtracks to films such as Behold the Earth, Chrystal, and Cold Mountain. Most recently, legendary singer Joan Baez chose his song “I Wish The Wars Were All Over” to be her last recorded musical statement. Eriksen is also a foremost educator on American folk music, focusing especially on the Sacred Harp four-part harmony tradition, founding the world’s largest Sacred Harp singing convention in Northampton, MA. As well, he has taught courses on music and ethnomusicology at the Five Colleges, the Smithsonian Institution, Harvard University, the Society for Ethnomusicology Convention, Colours of Ostrava Festival (Czech Republic), and the Early Music Festival in Jaroslaw, Poland. In addition to working as an educator within the Pioneer Valley, his research and collaborations have taken him around the globe, teaching figures such as Nicole Kidman, Elvis Costello, and Sting, as well as the members of the Young at Heart Chorus.